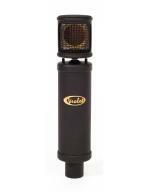 This microphone is in totally different league than most of the products at the same price. The sound of Black Knight is open, warm, full of details and very natural and close. Everything is perfectly balanced even when using pop-filter. It is not absolutely necessary to use shock mount, because the mic is very well isolated internally “ we think this is also thanks to jointed mounting of the head. Considering the capsule size and sensitivity it is very uncommon! Good work. Moving head is an excellent idea, especially when using the mic for recording guitar amps. As everybody knows even the small change in positioning the mic influences the sound and doing it with mic head and not with the stand is much more precise and comfortable. Black Knight is currently the cheapest proposal from Violet Design and we think that this should let many of home and project studio owners consider getting it. Of course also professionals can use it without hesitation. It is worth to note that every microphone and capsule have individual serial numbers and the manufacturer offers 5 year warranty.